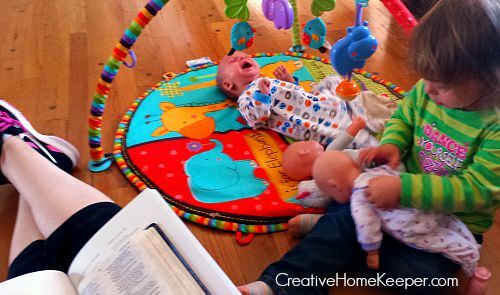 With a husband and three little one’s ages 6 and under, our home could quickly turn into a chaotic mess. From random burp cloths, diapers, flip-flops, books, toys, articles of clothing and other odds and ends, the clutter can quickly get out of control. I do a pretty good job of staying on top of the daily home management, thanks to this time saver, and I’m teaching my kids to pick up after themselves but there are always random stray objects that need to find their proper home. When my oldest son was just a baby and we started to accumulate lots of favorite board books to read aloud, I quickly discovered I would need a system in place to keep them organized and off of the floor. I didn’t like the way they looked shoved in his toy box with the other toys and I really wanted them out so he could always have easy access to them. So I discovered my favorite organizational strategy of book baskets. Book baskets are exactly what they sound like — baskets to store books in. I keep a basket of books and magazines I am currently reading on an end table in the living room (the rest of my books are stored on a bookcase). So I knew it would be a great solution to help tame his quickly growing collection of books. We now currently have several baskets placed around the house of children’s books for the kids to have instant and easy access. There are a few in their bedroom, a few in the living room, and a few in the basement playroom. I also keep a shelf in the closet, out of view, with our main collection of books so I can rotate new books in as well. This system beautifully keeps all of our favorite books handy, in view and organized as well as reducing the visual clutter of having books everywhere. I buy my baskets cheap either at the thrift store or on sale at Michael’s. Keeping book baskets around the house is such a simple concept that I created one just for my morning “un-quiet” time. 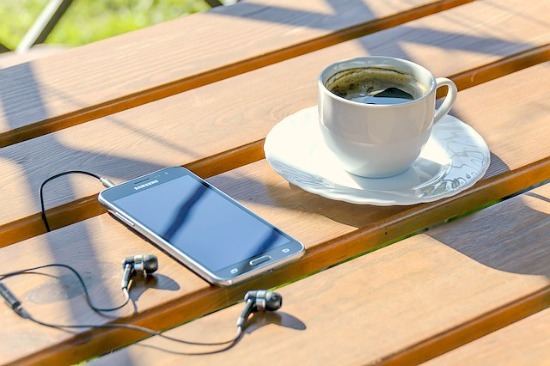 Having a quality morning routine is important to me, especially if I want to start my day on the right foot. I’ve since had to reclaim my mornings as I have adjusted to three kids this year. They are still a work in progress but thanks to this course I have been working on creating a routine that works well for this season of life. I plan to share more about how that looks in the next few weeks. Since one of my kids is always up super early it seems (I’ve been told there will be a day when I’ll have to drag them out of the bed) I never really get to have a set designated space to read my Bible or write in my prayer journal. 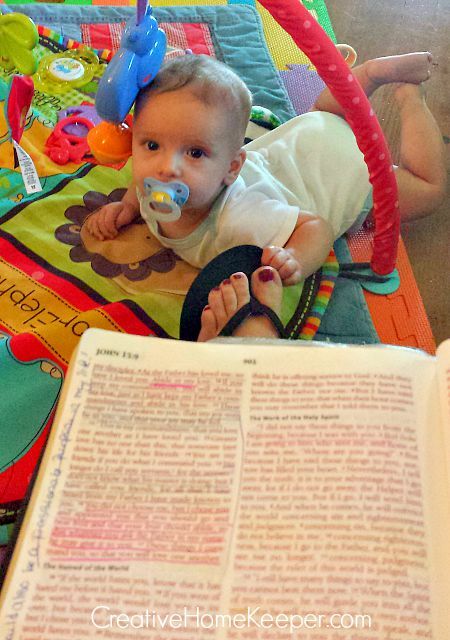 I dream of the day when I can claim a cozy, quiet spot in the house but for now, in this season of motherhood, my morning routine consists of having a devotional wherever my kids will let me. Some mornings it means I’m sitting on the sofa with little ones cuddled around me. Other mornings, when I’m lucky to have some real quiet time, I’ll spread out my Bible and devotional books on the dining room table. A few mornings I might read my Bible at my desk before I begin working. Since the spot changes most mornings I needed a system to keep all my Bibles, journals, devotionals and other materials organized and portable. I hated to sit down at my desk only to realize one of my devotionals was in a different location. 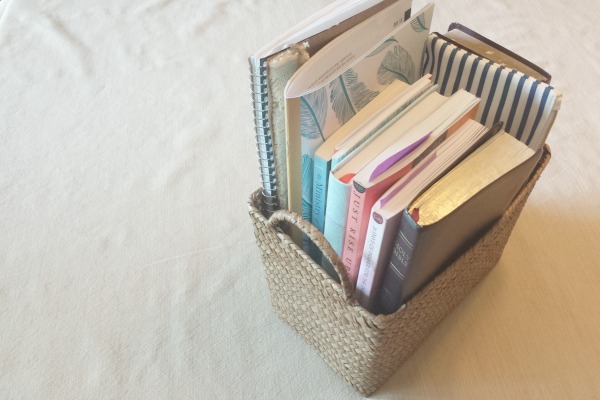 Thus I created a Bible Book Basket, the organizational system of using baskets was working so well for our books that I knew it was a no-brainer for my devotional materials. Like I mentioned above, if I’m having my Bible reading time on the sofa, at the dining room table, my desk or even outside on the patio, I can easily carry my small basket that carries everything I need. My Bible Book Basket goes where I go. 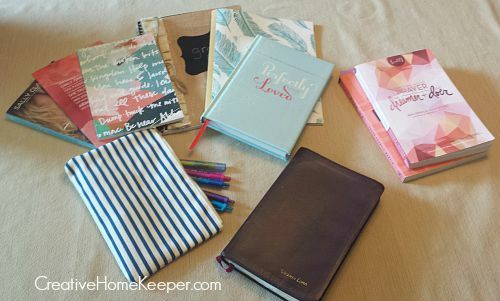 No more wasting precious moments hunting for missing Bibles, journals, devotionals or pens. Everything is right where I need it to be. Once I finish my devotional time, all the books and supplies go back in the basket and are stored on a shelf in my office. Everything is neatly organized and fits nicely into a basket. The basket stores well on a shelf. Even when I leave the basket in the dining or living room, all the books are organized nicely inside of it so it doesn’t look cluttered. It’s such a good teaching moment to model our kids the importance of carving out time for a daily devotional. It’s also a great way to show our kids that we value and respect our Bible and other study materials enough to keep them stored safely and organized. 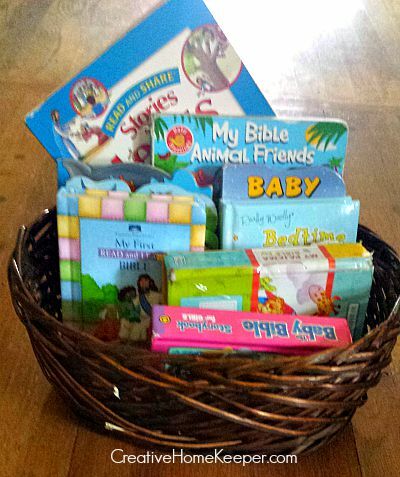 I also created a Bible Book Basket for my kids that is housed in our living room full of Bible board books and toddler Bibles, many of which we scored at the Dollar Store! When I tell my kids that Mommy is going to read from her Bible Book Basket, they promptly go and retrieve their own basket and read one of their books! So what do I keep in my Bible Book Basket? Last year I gave you the first glimpse into my basket but since time has passed, so are many of the devotionals I use. I wanted to give you a fresh updated look at what is currently in my Bible Book Basket. 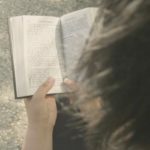 Want even more quiet time resources? 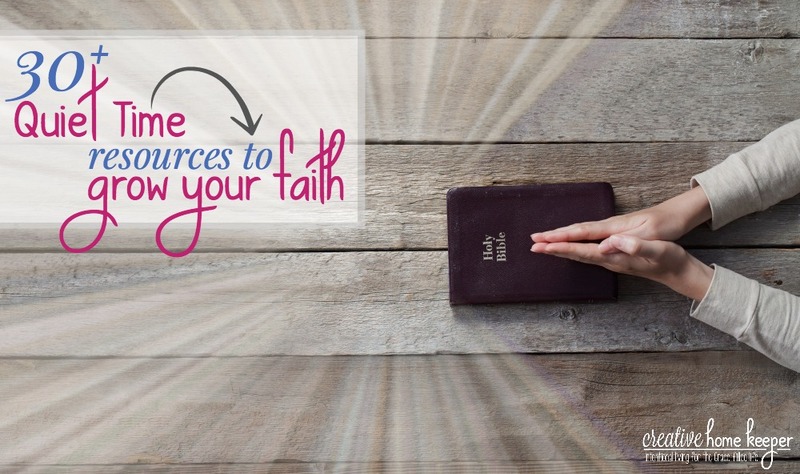 Check out this massive list of the best devotionals, Bible studies, and resources to grow your faith. Such a simple organizational strategy is also a huge sanity saving tactic because it keeps all of my Bible study materials organized, stored neatly and easy to move from spot to spot. This handy little basket has greatly impacted my daily time in the Word and since all my materials are in one place, there is no excuse not to be in my Bible every day! 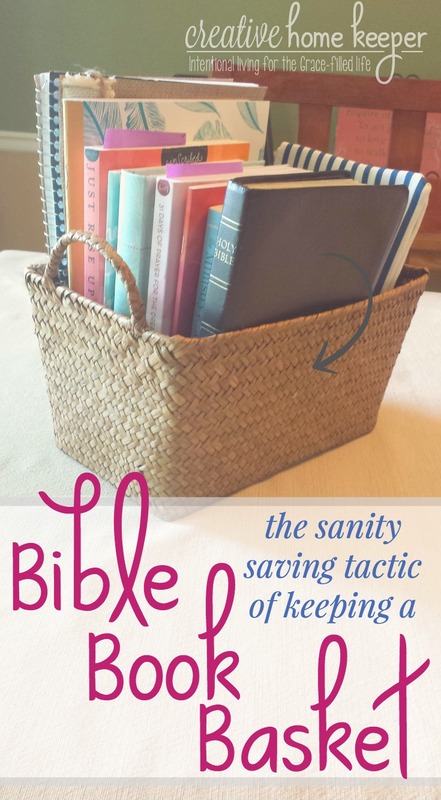 Do you keep a Bible Book Basket handy? 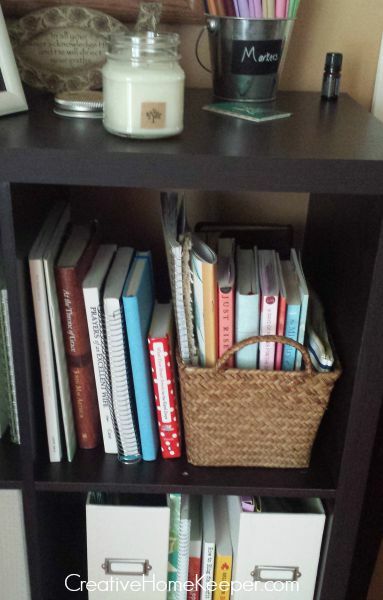 Or how do you organize and store your devotional materials for quick easy access? I love neat, orderly things. I never thought of putting together an area for all things spiritual learning. I might do this too. It would make things easier. Hope it helps you too Mary! I really like this idea! I recently rounded up some of my kids’ faves into a crate, but you’ve gone even further to themes, like the Bible book basket. Great idea! This is a great idea! I really need to get organized like you and do this. I’m constantly running around looking for my devotionals or books. This is a really lovely idea, both for children and adults. It’d be great for workbooks, school books, journals, etc. The baskets are cute too so it keeps the home organized AND beautiful. Yes! I plan on making some as my children get older for their school work and supplies. I hope to model and teach them the importance of keeping their materials organized this way. This would be so much nicer than my PILE of books, Bibles, Bible guides, notebooks, etc. that have taken over an entire corner of our living room. I really need to do this! Great idea of a Bible book basket. We have done this in our living room and it’s very helpful. Reduces stress as we can typically find what we need. Unless of course one of toddlers got into it. Thanks again! What a great idea! And I love that you are aware of what a great model you are setting for your children. 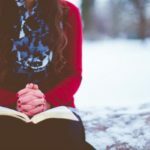 I actually went through a guilt phase when one of my children was still a babe–I knew I was doing the right thing, but it was hard to set babe down and read (emotionally). It wasn’t until I realized she needed to see me spend time with my Lord that I was able to be really satisfied. This is a great idea. I also like the idea of having book baskets around the house for the kids. They help so much with keeping all their books organized yet still handy. I love book baskets. I too started using them when my daughter was born. However, I never thought of a Bible book basket thought. Great idea, which I will be incorporating. Thanks! I love this idea and think I should make a mini basket for each of the kids as they both love to read and this would save books from being placed all over the living room! What a great idea! The only book basket in our house is one I use to keep track of borrowed books and dvds. I’ll definitely have to try putting my quiet time materials in a basket. I also think that it’s awesome that you have one for your kids too, it’s so great to get them in that habit early! Very cool idea! I love the books you have to read also! What an awesome idea! Love seeing the one for the children, too. I’ll be looking for some of the books you recommend. I saw “Savior” at the book store and it looked good, too. And the baby is beyond adorable! Thanks Pamela. I keep hearing about Savior so I think I need to add it to my list! Wow, i have never thought of this. It is neat and visually appealing. Great creative tip….I love it. I love keeping all of my books in a books in a basket! These are great tips!! Aren’t book baskets great Cathy? They are my favorite way to organize my books! I love that you have all different goodies in your basket. I have a hard time committing to one study or journal or Bible or style of study. I like to have it altogether. 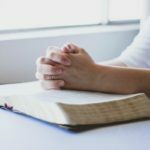 I’m looking for a meaty devotional to read, do you have any suggestions? This is such a great idea one that I’m starting TODAY. I’m always looking for my bible stuff because I’m like you a different place everyday. This is such a great idea! I think I’m going to have to start doing this.. I love that it’s portable and still fits nicely on the shelf. Thanks for sharing! You’re welcome Hannah! That’s why I love it too!